Octavo, contemporary quarter calf and mottled paper boards, spine ruled gilt, four raised bands, contemporary black morocco labels lettered gilt, marbled endpapers, leaf edges marbled, pp. (4) + xxiv + 367; (4) + 459, folding engraved map of the United States, hand coloured, with the half titles in both volumes, some leaves lightly browned as usual, a fine copy. En Francais dans le texte, 253. Downs, Famous Books since 1492. No.66. RARE FIRST EDITION of de Tocqueville’s masterpiece of political philosophy and one of the most important texts in political literature. 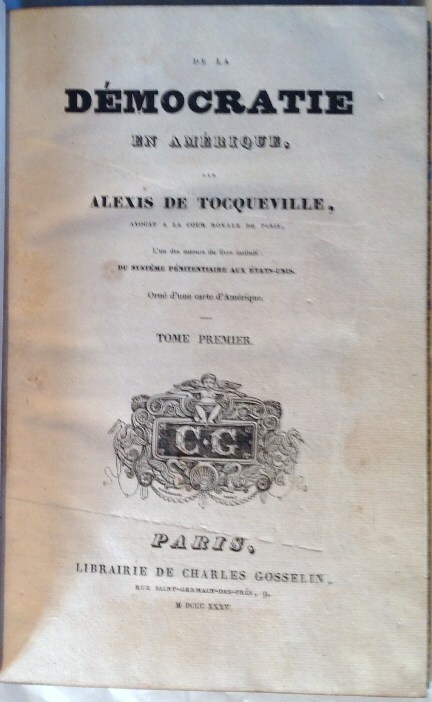 De la Démocratie en Amérique by Alexis de Tocqueville [1809-1859] was first published in January 1835 in less than 500 copies and in 1840 two concluding volumes were published with the eighth edition.